Randall and Susie were boyfriend and girlfriend. Susie loved going with Randall in his car where they would stop at a local drive-in and get a Coke and fries. Next they would go out to the woods and park where they would smooch for an hour before he had to take her back home. Until fifty years later. 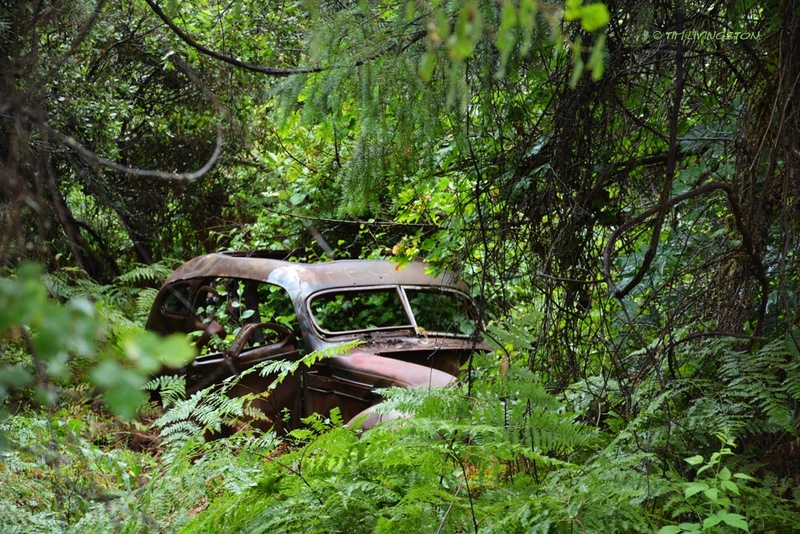 The old rusted car was found among overgrown plant growth with two skeletons in the front seat holding hands. They are forever lovers. Thank you Tim Livingston for our photo prompt this week! 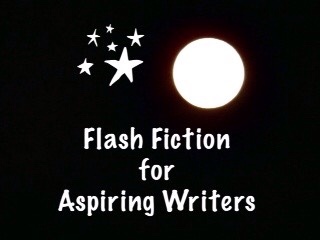 This is my 124 word story for the flash fiction challenge, Flash Fiction for Aspiring Writers. We are given a photo prompt and approximately 75-175 words with which to create our stories. It's fun and everyone is invited to participate. For more information, click HERE. Aww, what a way to go. Yes, it is. If you got to go that would be the way to do it! LOL! I wonder what killed them. I didn’t get that far. I guess we have to use our imaginations. Thank you for reading Margarisa! Ah…yes. A mystery to ponder over. My pleasure, PJ! Actually, Margarisa, I wondered the same thing myself. Though a little morbid I was comforted that they were together till the last. Love has a funny way of making us do things we normally won’t, I sort of got that from this story, maybe my overactive imagination! Thank you PJ for a twist at the end! Yes, I understand. I have an overactive imagination too. Love really does funny things to us, that is true. Thank you James. Yes, it is tragic but at least they were together. A sad story, I wonder if carbon monoxide poisoning was the cause of death. That sure could have been the reason! I hadn’t thought of that. Forever Lovers. How horribly sad and yet….lovely. Thank you Colleen. Yes, it is terribly sad but reassuring that they were together. Yes, it sure is! Jodi, I just got back from the vet’s office. I had to have Bria euthanized tonight. Monday he diagnosed her with Congential Heart Failure and gave her a diretic to get the fluid off her lungs. This afternoon she started seizing one right after the other. It was terrible. I’m so sad. Thank you Jodi! I appreciate the hugs and yes, I can feel them!! Sad tale indeed, but holding hands into eternity is happy! I am a sucker for happy endings even if the story is morbid. LOL! Yes, I too loved the smooching part! Haha! I don’t know what happened. I guess they died so they could be together forever. LOL! I don’t know how they died. Maybe carbon monoxide poisoning. Thank you so much Neel! Ooh I wonder what happened there! I don’t know. Maybe it was carbon monoxide poisoning. Yes, many questions remain unanswered. Thank you so much! Aw, such a tragic ending. I love the story’s title, Joy. Such a bittersweet ending. On one hand, it’s so romantic, but on the other, so tragic. I wonder what happened to them? I’m not sure what happened to them. Carbon monoxide poisoning?? Thank you Jade! If one must pass away wouldn’t it be wonderful to be with someone you love completely. A touching story, PJ. I enjoyed the read. That’s so true Isadora. The way I would want to go. Thank you so much! Yes, the kiss of death. Thank you for reading! Creepy! Next time I see that old car, I will stop and peek inside. I’ll be that person in the horror movie that makes us yell “don’t go into that dark secret room.” No good can come of it! Love it Joy! Hahaha! Thank you so much Tim! That would be crazy if skeletons were really inside! LOL! People loved your photo! If there are, you know the police will have questions! You seem to know a little too much. Hahahaha! Be sure to tell them you don’t know me. LOL! Thank you so much Funsie! I am sure this is a mystery Sherlock Holmes can solve! LOL! Yes, a Romeo and Juliet of the Motor Age. Sad but so poignant and it leaves the reader wondering … as a flash should. Great write. Thank you so much YS! I appreciate you reading and commenting. Great story! Heartbreaking on so many levels. Thank you so much Kay! I appreciate you reading and commenting! A very interesting story, Joy! It leaves the reader with so many unanswered questions and a feeling that at least they were together…forever. Yet, thoughts of their parents and the questions they had to live with all those years. Yes, that is true. Thank you Jessie! I’ve heard about getting lost in the moment…but this is a bit extreme. 🙂 Oh, what could have happened to the two young lovers? Intriguing story. Yes, this is a bit extreme! LOL! It might have been carbon monoxide or maybe a murder??? Great take on the prompt! Loved this story! Thank you so much Rosemary! Happy St. Patrick’s Day! Thank you so much Mandi! I’m not sure how they died but they could have been shot or they could have died from carbon monoxide poisoning. Let’s hope it was the least painful method. Yes, I agree and I am going to believe that it was. There were in the car holding hands and listening to the radio and were unaware they were being overcome by carbon monoxide gas. You’re right. It probably was carbon monoxide poisoning. Thank you so much Deb! You’re very welcome!! Great story. I could see this expanding into more. It really is a story that could be expanded more. It could go a lot of different ways! It really could. If you’re ever in the mood to write a post but not sure what to write about…here it is! !